"Moonage Daydream" is a song written by David Bowie in 1971, first released as a single with the band Arnold Corns. A re-recorded version, featuring Bowie and his band The Spiders from Mars, was released in 1972 on The Rise and Fall of Ziggy Stardust and the Spiders from Mars. (1971) "Hang On to Yourself"
The song tells of an alien messiah and hints at his destiny to save the world from the impending disaster described in Bowie's "Five Years", as well as his fate as the quintessential "soul lover". "With Bowie, you're spoilt for choice when it comes to sci-fi-inspired songs," observed Tim Wheeler of Ash. "But 'Moonage Daydream' is my favourite. It's got a great riff and it sounds really pretty in a weird kind of way, even though the lyrics are quite dark." In the story arc of The Rise and Fall of Ziggy Stardust and the Spiders from Mars, this is one of the most important songs. It describes the creation of Ziggy from a combination of religion, romance, sexual freedom, rebellion, and passion; he metamorphoses into the archetypal rock star. Moonage Daydream: The Life and Times of Ziggy Stardust is the title of a book written by Bowie, published in 2002 by Genesis Publications, named after this song. It documents the years 1972–73 and is fully illustrated with the photography of Mick Rock. Bowie and Rock met in 1972 and formed a working relationship and lasting friendship. Subsequently, Rock was the only photographer authorised to record the two-year career of Ziggy Stardust. 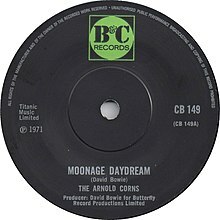 The Arnold Corns version of "Moonage Daydream", recorded on 25 February 1971, was released by B&C as a single in the UK on 7 May 1971. "Hang on to Yourself" was the B-side. The official band line-up, fronted by dress designer Freddi Buretti, was a total fabrication; Buretti was at the session but his contributions were simply lost alongside Bowie's. The Arnold Corns version was released on CD in 1990, as a bonus track on the Rykodisc rerelease of The Man Who Sold the World. It also appeared on the Ziggy Stardust – 30th Anniversary Reissue bonus disc in 2002, and on Re:Call 1, part of the Five Years (1969–1973) compilation, in 2015. Bowie recorded the song for the BBC radio programme "Sounds of the 70s: John Peel" on 16 May 1972, and this was broadcast on 23 May 1972. In 2000, this recording was released on the Bowie at the Beeb album. A live version recorded during the Ziggy Stardust Tour at Santa Monica Civic Auditorium on 20 October 1972 has been released on Santa Monica '72 and Live Santa Monica '72. The version played at the famous concert at the final concert of the same tour, at the Hammersmith Odeon, London, 3 July 1973 was released on Ziggy Stardust - The Motion Picture. It features an extended guitar solo in the outro, which gave Bowie time to change costumes. A concert recording from July 1974 during the Diamond Dogs Tour was released on David Live, and a live version from September 1974 (previously available on the unofficial album A Portrait in Flesh) was released in 2017 on Cracked Actor (Live Los Angeles '74). OThe song was performed once again on the Outside Tour in 1995, and a live version recorded on 13 December 1995 was released on the "Hallo Spaceboy" single in 1996. This version was also released on the bonus disc that followed some versions of Outside – Version 2. The 1971 Dutch Philips single (issued as "Moonage Dream") starts with someone (presumably the engineer) saying "Whenever you're ready...."
The song was released as the B-side of the rerelease of the single "Space Oddity" in December 1972. It also appeared on the compilations The Best of David Bowie (Japan 1974), Starman (Russia 1989), Sound + Vision (box set) (1989), Best of Bowie (US/Canada 2002), Nothing Has Changed (2-CD/3-CD 2014), and Bowie Legacy (2-CD 2016). A remix of the song, created for a 1998 Dunlop television commercial, appeared on the Ziggy Stardust – 30th Anniversary Reissue bonus disc. The song appeared in the movie Guardians of the Galaxy and on its soundtrack in 2014. ^ Wheeler, Tim (August 2007). "Sci-fi rocks". Q: 117. ^ "He's My Brother She's My Sister EP, by He's My Brother She's My Sister". He's My Brother She's My Sister.